Regex flavours differ from language to language so while this question never mentions C#, it might be relevant. Maybe the question itself needs editing to mention its desired language? The question is nearly 10 years old at this point and if this truly was a relevant edit, I would've thought it would have been made by now (considering it also has 34.5k views). I have decided to reject the edit on these grounds, quoting "Regex flavours differ from language to language so the C# tag is likely relevant." - was this the right action to take? Language tags should not be removed from regex questions. While the question is indeed a regex question, regex has many specific implementations that differ between which programming language is used. Without knowing which implementation the OP is using, you can't be sure if an answer is valid. You can check Wikipedia on differences between regex in languages (the fact that they split the comparison table in two already tells you a lot). 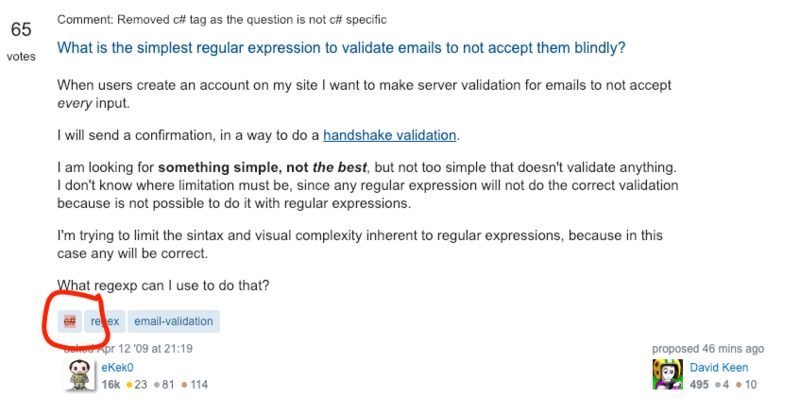 The regex excerpt also states that adding a language is required. Removing a language is a bad edit. The fact that the accepted or top answer might work under many different languages is not a reason to remove the language, since future answers might want to include less broadly implemented features. Not the answer you're looking for? Browse other questions tagged discussion tags suggested-edits . Should I approve suggested edits that only add/remove tags? How to treat such questions? Should I remove (seemingly unimportant) language tags to make room for important ones? Should language tags be used for IDE questions? Remove language tag when not directly about that language?